Corine De Farme - Micellar Purity Water - Cherry Colors - Cosmetics Heaven! Today I have a review about a product I've been using for the past few months. 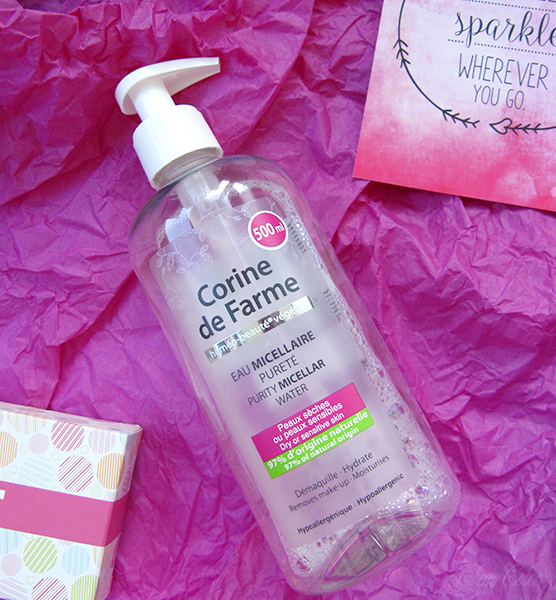 It's the Corine de Farme micellar water and don't worry if you never heard about it. I haven't heard about it until I found it in our local Muller. Let's go to the official description and then I'll tell you my thoughts about it. This micellar purity water is composed of micelles, small particles of tensioactives which trap impurities found the surface of the epidermis. These micelles effectively remove make-up and thoroughly clean the face, eyes and lips. With its gentle formula and peony flower extract known for its toning properties, micellar purity water leaves skin fresh while respecting the fragility of dry or sensitive skin. Okay, so the official description sounds awesome, right? Well, my experience wasn't all that great. Why? Read on. Okay first I want to say that it's really cheap - 7€ for 500 ml. Sounds like an awesome deal, yeah? Well, not for me. For me, it was 500 ml of nightmare "water". Okay, not exactly, nightmare, but close enough. I started using it with some new cotton pads, which were more expensive than my normal ones, They were also more compact and thus they would drink up more of the product. Also would break easily once soaked. I'm talking about the Tosama line Jasmin, and these are "sensitive". Oh, the joke! These pads would rub and drag my skin, so at the end it would burn! Of course, it's not just the pads fault. Nope. Sadly. After I switched the pads to some softer ones from the same damn line (which break in two pieces.. not buying anything from that line again), the problems persisted. This micellar water made my skin (mixed!) BURN. I would remove my makeup, and pray to all gods out there that it wouldn't go into my eyes, even if that's the only part where it didn't burn. Haha. Anyway, I used lots of it for makeup removal and at the end my skin was RAW. Feeling dry and kind of tugging, hurting. It's a first for me really. I'm not used at products doing damage to my skin, especially not a "sensitive" micellar water. But it may be just my skin (now it's going from super oily / normal to dry/normal because of the switch of weather). Or it may be the product. In any case, I'm staying away from it. Oh, you also may ask yourself - But why wouldn't she ditch the product sooner? Because I couldn't afford to buy another one and because I hate wasting product. Seriously. Using up products is my "life purpose" when it comes to beauty products. That gives me the most satisfaction. And I'm a bit stubborn. Usually, I am a huge fan of inexpensive products. I'm the first to try them and fell in love with them. But this time something went terribly wrong and I can't wait to ditch this Micellar water from hell. I don't think I ever gave a product 1 star, but I feel strongly towards it. I dislike it a lot. The price and pump are awesome, tho. I tried using it in so many different ways but none worked for me. But do you know for who it worked? Živa, she loved it and said it's amazing, so experiences may vary!